The Breguet Tradition collection combines the classic roots of the Swiss manufacturer with modern innovations of their master watchmaker. In contrast to many other designs, this series showcases their calibers on the dial side. The watches harken back to the subscription watch developed by Abraham-Louis Breguet. Breguet was the watchmaker to define these pocket watches as mechanical instruments with visible movements on the dial side. 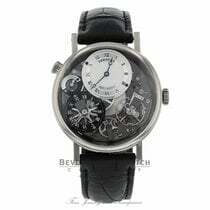 Back then, sales of these watches followed the subscription principle, whereby the buyer paid a fourth of the price in advance. This was a novel practice at the time and enabled the manufacturer to transition to methods of mass production. Of course, the subscription principle is no longer in use for Breguet's Tradition wristwatches. However, they do still have the open design on the dial side. The gear wheels, as well as the balance wheel, can be observed in motion. The Tradition collection was introduced in 2005 with the unveiling of the 7027 model. This watch unites classic marks of the L'Abbaye-based manufacturer with modern designs and 21st century watchmaking. In 1775, A.-L. Breguet founded a small workshop in the Parisian watchmaking quarter on the Ile de la Cité. He established a clientele of European kings, tsars, and emperors over the years. 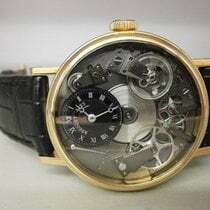 During this time, Breguet was a purveyor to the French court. This honor wasn't achieved overnight, but rather through the painstaking development of inventions like the tourbillon and pare-chute shock protection, which constituted groundbreaking innovations in watchmaking. The manufacturer has been a part of the Swatch Group since 1999 and is still today one of the finest in Haut Horlogerie. This status is illustrated by forward-thinking inventions like the magnetically mounted balance pivot or the use of modern materials such as silicon. The inner workings of the watches in the Tradition collection steal the show. The watchmakers simply reverse the caliber, giving the wearer a view of the balance wheel, escapement, and train. The Tradition Grande Complication 7047 also features a tourbillon, a mechanism invented by A.-L. Breguet in 1801. The complication minimizes deviations in precision caused by gravity, which occur mostly when watches are kept in an upright position. The inventive watchmaker mounted the balance wheel and escapement in a cage that rotates once per minute. This rotation significantly compensates for the effects of gravity. Watches with tourbillons are still the best performers on chronometer tests. The caliber 569 powers the manual 7047 watch. This timepiece features some of the most modern watchmaking materials, including a titanium balance wheel and a silicon balance spring. The Tradition Chronographe Indépendant 7077 illustrates an additional special feature of this collection. The watch is powered by the caliber 580 DR and has two independent balance wheels. The chronograph operates at a frequency of 5 Hz, or 36,000 alterations an hour (A/h). This allows the wearer to stop time down to a tenth of a second. However, operating at a higher frequency increases the caliber's power consumption, so the timing function can only reach 20 minutes. The caliber's high power consumption has the potential to significantly shorten the watch's power reserve as well. In order to avoid this, the actual time display has its own balance wheel, which vibrates at a comparatively slow 21,600 A/h. Thus, the watch still has a power reserve of 55 hours. The patented balance spring is made of silicon, similar to the 7047, and the chronograph's balance wheel is made of titanium. 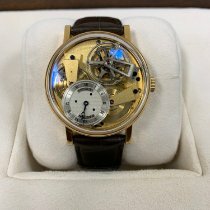 At first glance, the watches in the Tradition series may appear avant-garde or even futuristic, but if one looks again, the characteristic signs of Breguet watches become more obvious. These signs have formed the brand's style for centuries. For instance, the vertical fluting on the case band is bordered above and below. The guilloché dials are scaled-down and placed off-center at either the twelve, two, or six o'clock positions. The iconic Breguet hands, with their crescent moon-shaped ends, point to the time, while the hours are marked by classic Roman numerals. The cases are either made of platinum or 18-karat white or rose gold. The watches in the Classique series carry these characteristic signs and more. Each Classique watch carries the secret signature and a unique production number, making every Breguet watch one-of-a-kind. The sporty watches in the Marine collection are also fine examples of the Swiss manufacturer's masterpieces. They reinterpret the brand's traditional characteristics with modern touches. Versions with rubber straps emphasize the series' sportiness, as does the Marine 5847's water resistance up to 30 bar. The models in this series are designed for both men and women. The watches in the Reine de Naples series, however, are perfect for the fashion-forward woman. The flat, oval case pays homage to the first wristwatch A.-L. Breguet designed for Caroline Murat, Queen of Naples and sister to Napoleon.